2In a saucepan combine 2 cups of blueberries, 1/2 cup of sugar, 1 teaspoon of lemon juice and a few drops of vanilla extract and 1 cup of water and bring it to boil over high heat, stirring continuously. 3Reduce the heat and stir until the sauce begins to thicken. Then remove it from the heat and let it cool. 5Whisk 2 eggs in a small bowl or soup bowl, on another plate place the breadcrumbs and on the third place the flour. First coat the Brie with flour on all sides, then dip it into whisked eggs and then coat it with breadcrumbs. 6Heat oil in a saucepan or deep fryer and fry the cheese on both sides until the breadcrumbs are golden. Drain the cheese well on a paper towel. 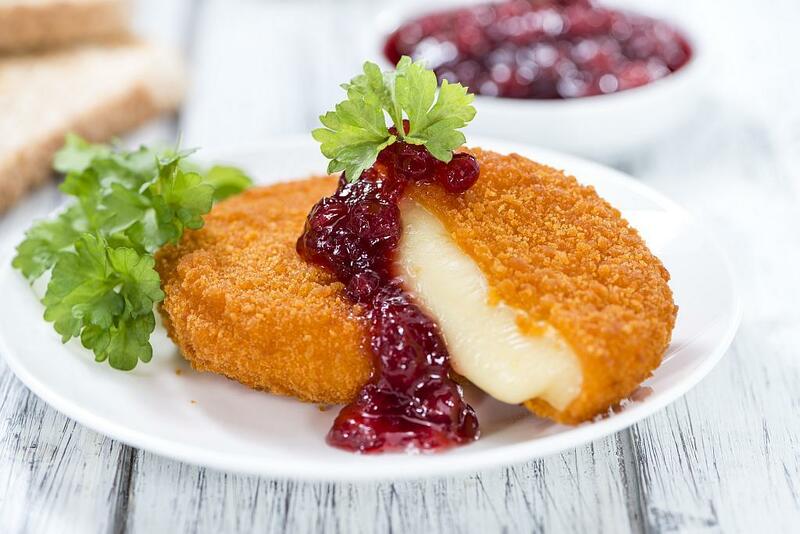 Serve it while the cheese is still warm with blueberry sauce and rocket salad. You can serve it also with cranberry sauce, which you can prepare in the same way as the blueberry sauce. If you don't want to use sugar for making blueberry sauce try with adding 2 tablespoons of agave syrup or honey. If you want you sauce to be thicker you can add 2 teaspoons of cornstarch.